Our IT helps event on 1st September generated some thoughts, feedback and website ideas which have been collected into a PDF guide of useful online resources. Thank you to everyone who contributed to the day. As promised a guide has now been produced which lists all the sites and apps we looked at, suggestions from the day and many others. 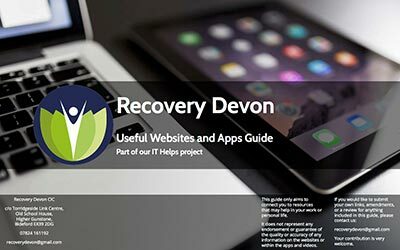 Included are websites, mobile apps and videos, all focussed on mental health and recovery and most of them free to access. If you know of a great app, video or resource which isn’t in this guide please let us know by leaving a link in a comment. We’ll be collecting new ideas and adding them to the guide for a ‘version 2’ next year.